This image from NASA's Lunar Reconnaissance Orbiter centers on the South Pole-Aitken basin, the largest impact basin on the moon, and one of the largest impact basins in the solar system. The moon, which has been pummeled by a barrage of asteroids and debris throughout its lifetime, experienced a strong uptick in the energy and speed of incoming rocks around 4 billion years ago, new research suggests. A team of researchers from the NASA Lunar Science Institute (NLSI) at the Ames Research Center in Moffett Field, Calif., tracked the history of crater formation on the moon using digital maps, and found evidence of a dramatic shift in the velocity and energy of the asteroid bombardment during a period called the "lunar cataclysm" that occurred 4 billion years ago. The timing of this shift could coincide with disturbances in the solar system's main asteroid belt caused by changes in the movement of the outer planets, the researchers said. Detailed maps of the lunar surface from the United States Geological Survey previously identified ancient regions on the moon to look for clues about the bombardment. The new study combined these observations with new data from NASA's Lunar Reconnaissance Orbiter to study the impact craters found on these ancient surfaces. The scientists found a subtle shift in the size of the younger craters that points to an increase in the velocities of the asteroids that created them, compared with the most ancient basins on the moon. Post-lunar cataclysm diagram of our solar system. 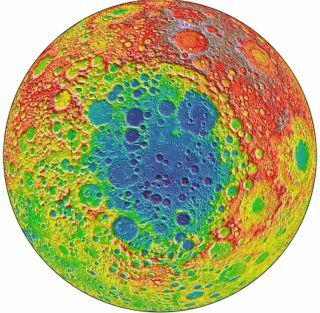 In fact, craters near the Nectaris basin were formed by collisions that struck twice as fast as those found on more ancient lunar terrains, the researchers said. Within that window of time, the velocities of the incoming asteroids during the lunar cataclysm were likely ramped up by the movement of Jupiter and the other outer solar system planets, they explained. "It is fascinating that the surface of our own moon records evidence of orbital changes in Jupiter and Saturn that took place so long ago," Yvonne Pendleton, director of NLSI, said in a statement. In the early days of the solar system, inner planets, including the Earth and the moon, were repeatedly whacked by debris that formed the building blocks of the planets. As this material was eventually incorporated into the inner planets, the rate of these violent collisions decreased. But, around 4 billion years ago, a second wave of impacts reportedly took place, which forms the basis of the lunar cataclysm hypothesis. These collisions, which struck at much higher velocities, could have been caused by objects in the main asteroid belt that were dislodged and thrown into the inner solar system from the reorganization of the outer planets. "This is an exciting time for lunar research with LRO and other spacecraft providing so much new data," study lead author Simone Marchi said in a statement. "Collaborating with scientists of different disciplines allowed us to link these observational data to dynamical models to put new constraints on solar system history." The findings of the study were published in the journal Earth and Planetary Science Letters.